Hello! 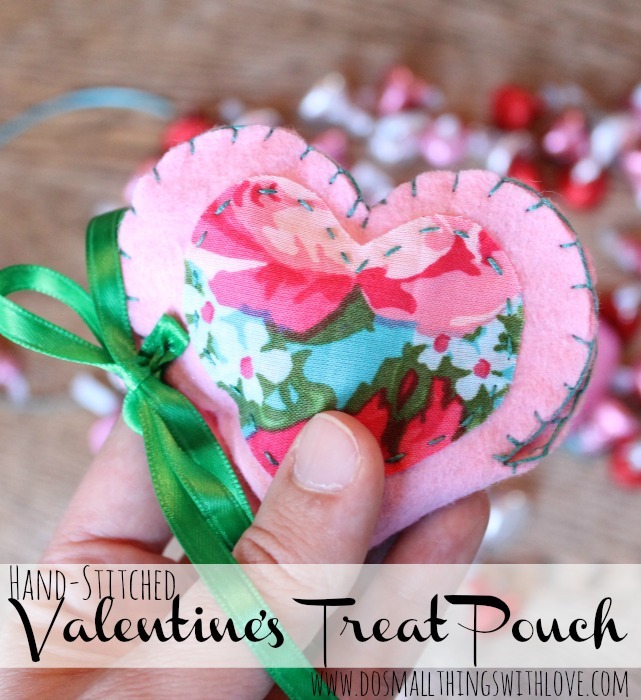 I have a sweet little project for you to stitch you for your sweetie with Valentine’s Day: Valentine’s Treat Pouch. This project is made out of felt, just like the Valentine’s Treat Bags I shared yesterday, but this one takes a little bit more time, and therefore should be given to someone a little bit more special. Also, this one is much smaller and closes securely. Also, I whipped up this little pouch with my friend #MyFavoriteBloggers. Each month we all create on a certain theme. 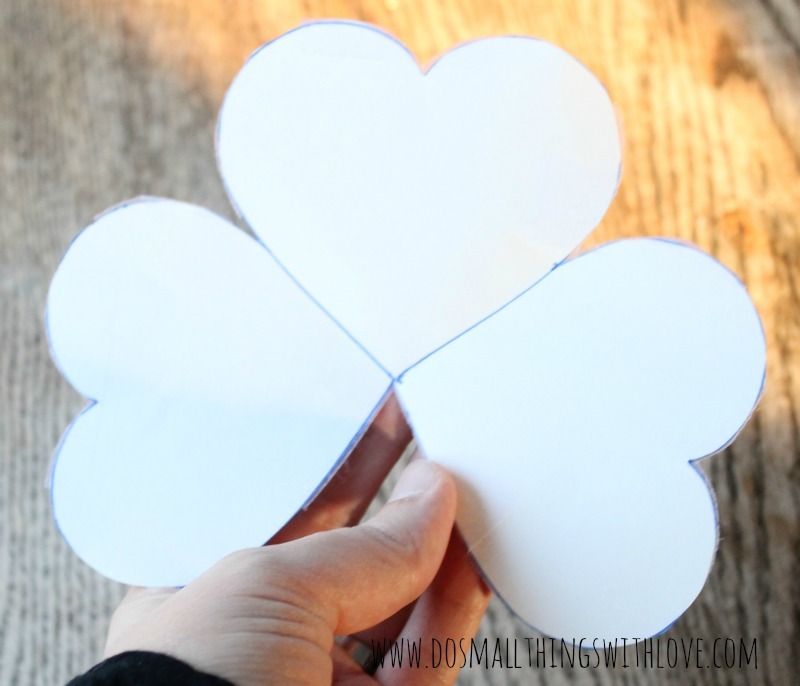 This month we all created Heart Shaped projects. Make sure to read all the way to the bottom of this post to meet the whole gang and to see all their creative projects. 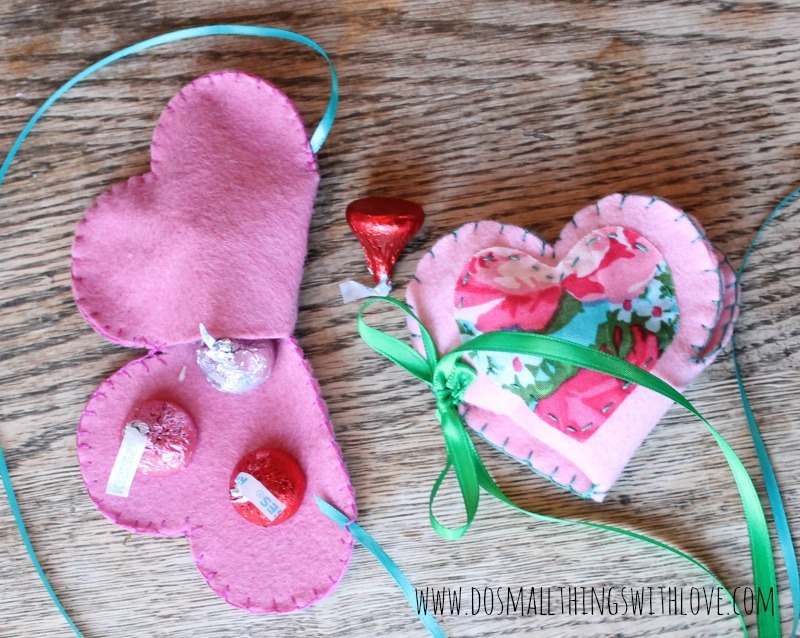 But first, how to create your own Felt Valentine’s Treat Pouch. First of all, take a look at how this pouch is set up. 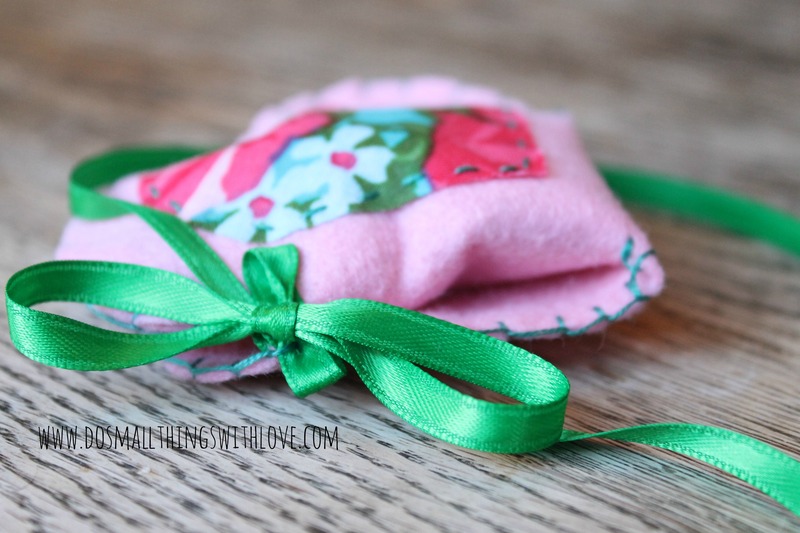 In order to make a pouch all you need is one piece of felt, thread and a ribbon. And, as you can see from the pouch that is open, the felt needed for this project is just 3 conjoined hearts. So, the first step is to make your own pattern. Below is a picture of the pattern I made for this project. So, to make your own pattern, cut out a heart that you like. Then, using a thick piece of card-stock trace the heart three times with the straight part of the heart touching. Stitching up pouch is pretty simple. Add a little bit of embellishment to the front of the middle heart. I did this by adding some patterned cotton fabric in a heart-shape and stitched it down with a running stitch. Next, fold in one of the hearts, with the embellishment on the outside. Pin a long piece of ribbon right at the top corner of the fold. Then, blanket stitch around the entire perimeter, making sure to stitch in the ribbon as you go. 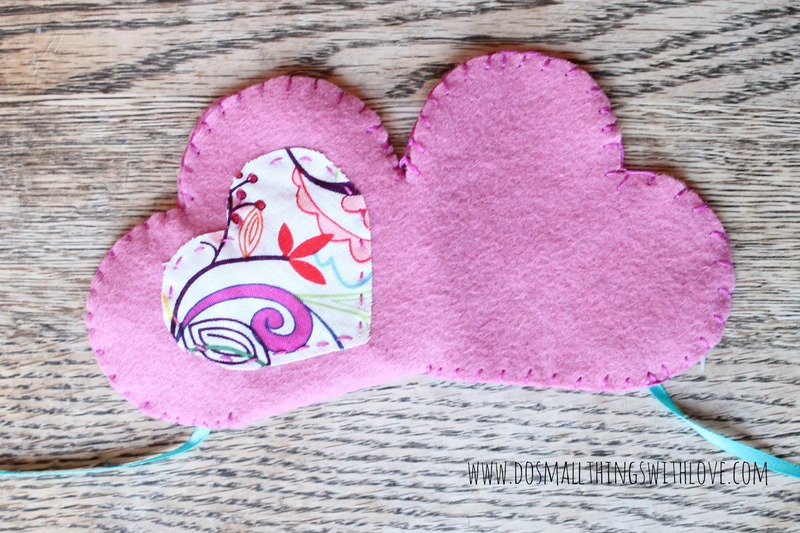 Keep going and blanket stitch around the third heart that is not folded it. Once again stitch in ribbon as you go. See, doesn’t it look so cute when it’s all folded up? 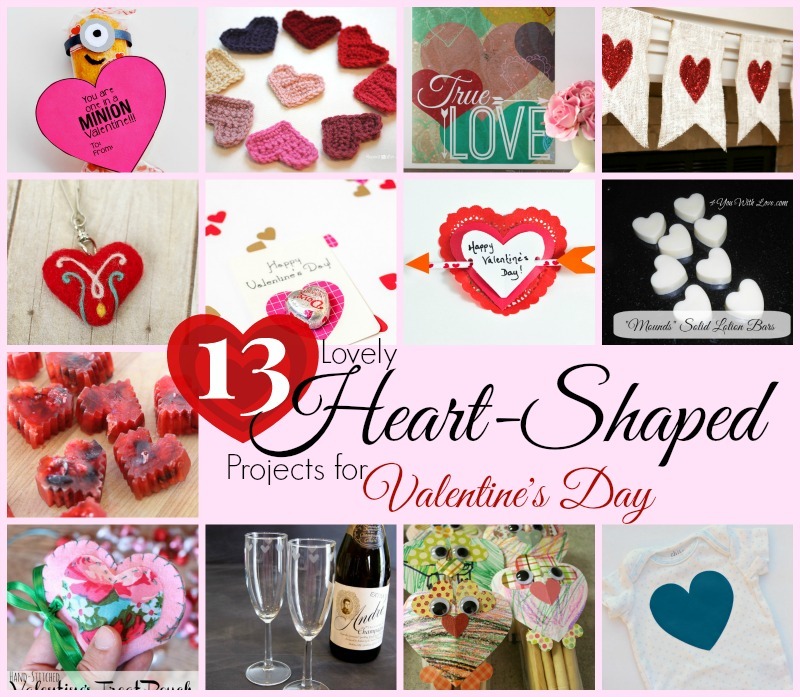 Now, as promised, a few of my friends have been creating heart-shaped projects as well. I love these ladies and I’d love for you to check out their projects and their blogs! Here they are! 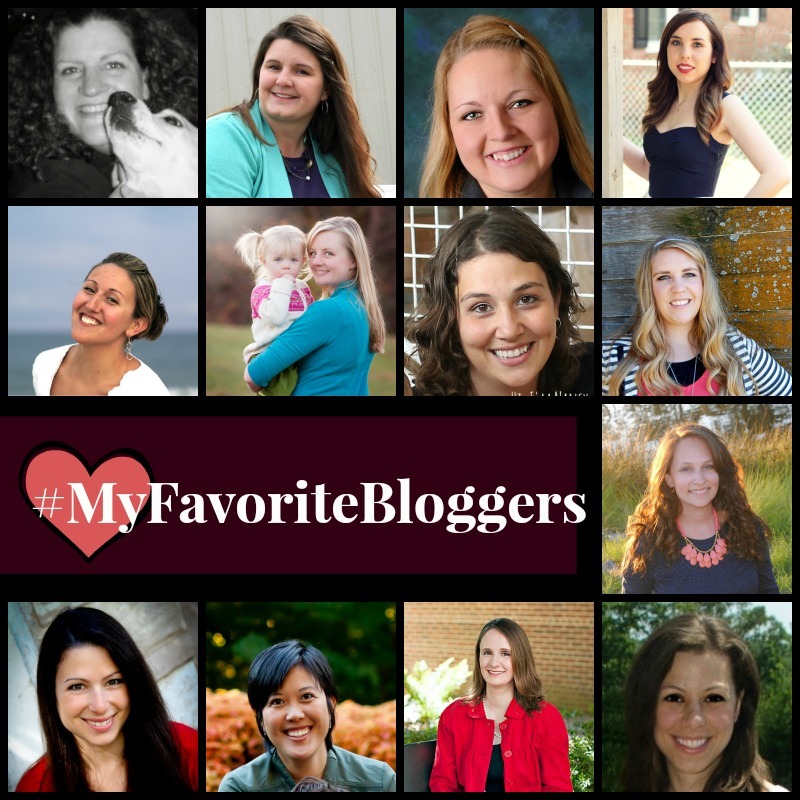 From left to right, top to bottom, here are this month’s #MyFavoriteBloggers: Marilyn from 4 You with Love, Sky from Creative Capital B, Adrianne from Happy Hour Projects, Bethany from Pitter and Glink, Lauren from Thinking Closet, Tara from Suburble, Nancy from Do Small Things with Love, Emily from The Benson Street, Kara from Happy Go Lucky, Sarah from Repeat Crafter Me, ChiWei from 1 Dog Woof, Melanie from It Happens in a Blink, and Kara from Petals to Picots. We all came up with different heart-shaped projects. I’d love for you to go and check out all of the wonderful Valentine’s Crafts that my friends created! Once again, from left to right, top to bottom: Printable Minion Valentine from The Benson Street, Easy Crochet Heart Pattern from Repeat Crafter Me, Free True Love Valentine’s Printable from Pitter and Glink, Glitter Heart Burlap Banner from Happy Go Lucky, Needle Felted Heart Key-chain from Petals to Picots, Simple Heart Chocolate Valentine’s from 1 Dog Woof, Handmade Valentines from Suburble, Solid Lotion Bars from 4 You with Love, Berrylicious Heart-Shaped Ice Cubes from The Thinking Closet, Felt Valentine Treat Pouches from Do Small Things with Love, Etched Champagne Flutes from Happy Hour Projects, Heart Owl Valentines with Your Kid’s Art from Creative B, and Heat Transfer Vinyl Heart Onesie from It Happens in a Blink. Okay, why are you still here? Get over there and check out their projects! the only type of projects I every have time for is small projects!! So cute! And so many great heart projects! How fun! This is such a cute idea, this would make a wonderful valentine gift! Thank you for sharing it! Thanks–and thanks for stopping by! How cute!!! What a fun little way to give people Valentine’s treats! I love it! So cute! My nieces would love this. What a great little gift to give. Oh, cute! And yay for holding chocolate!!! Your sewing skills amaze me Nancy, always! I’ve never tried a blanket stitch, but it looks so neat, and I love the pouch idea! These are SO PRETTY! And I love that they hold CHOCOLATE!!! How clever! I love that it’s also a sweet keepsake! So sweet, Nancy! My girls would thrill at receiving one of these little pouches! You are so creative with all your felt projects Nancy!